shanghai bike polo: what do you need to play? this is probably the second question i get asked when telling people about bike polo here in china. the answer is simple really : a bike, a mallet, and a ball. 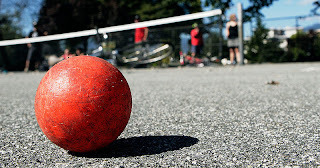 - The most commonly used ball is a plastic street hockey / road ball. so other than that you really don't need much! of course, safety equipment is suggested, but not necessary. any help on where to find used ski poles would be GREAT - just shoot me an e-mail.